I am writing your birth story two days before you were even due to enter the world, during Hurricane Matthew- your first Florida hurricane. You apparently like storms, because you tried to come early during storms from Hurricane Hermine at only 34.5 weeks. That is part 1 of your birth story- and the first slumber party I got to have with your mama and Nannie. Your mama had been having inconsistent contractions earlier in the day, but during a shopping trip to Wal-mart things started to get more intense and consistent. Instead of heading home, your Nannie brought your mama straight to Orange Park hospital to check things out. The weather wasn’t icky then, but the car was giving them fits and basically limped down the road barely making it into a parking space. It was 6:40 pm when they checked in with triage and your mama was measuring at just 1 cm. After a full bag of fluids, contractions continued to get stronger and at second check your mama had progressed quickly to 4 cm. 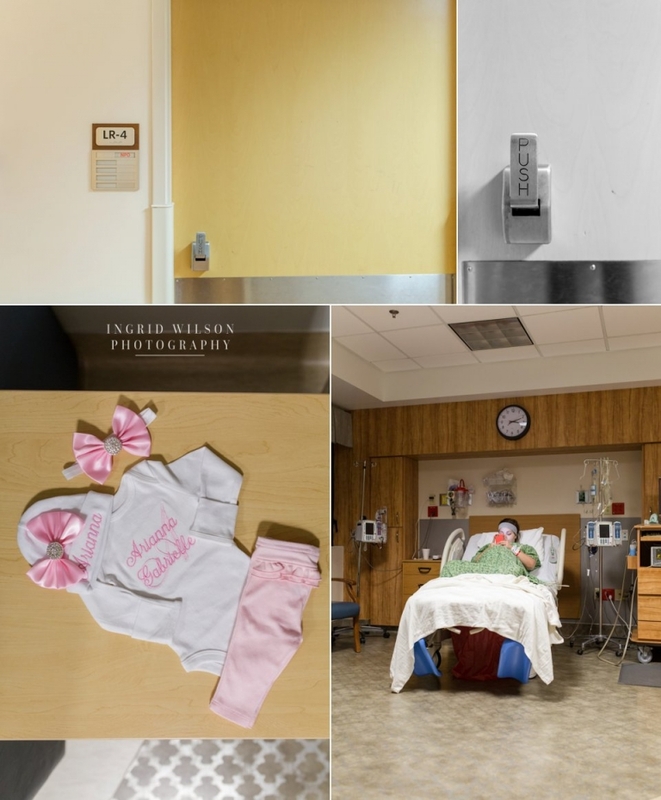 They were moved from triage to Room 4 and prepared excitedly to meet you soon. 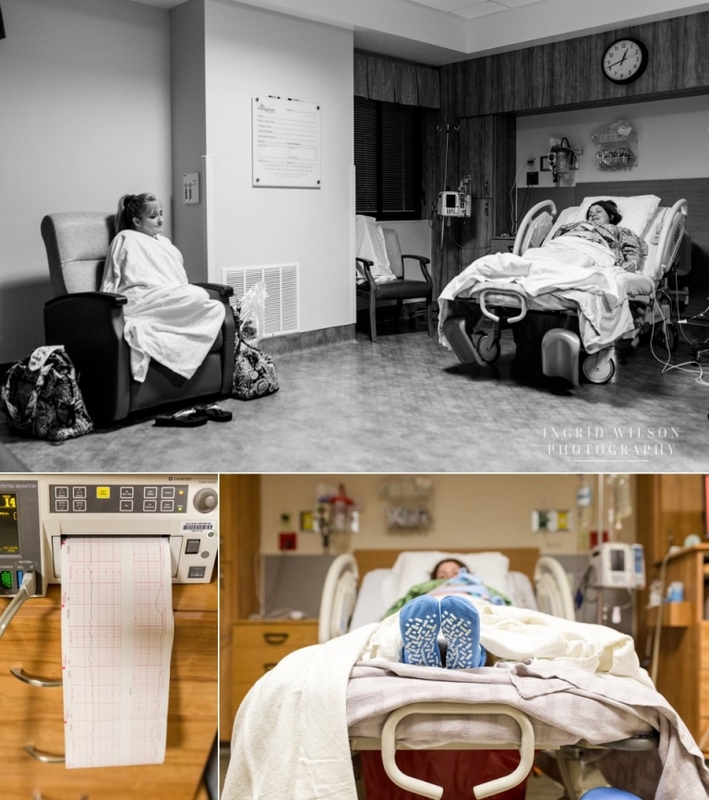 The storm began and started to get strong along with your mama’s contractions and I was called to come and document all the fun. At 10:50 pm, the sonogram technician came in to take a peek at your size and see how you were doing. Measurements showed that you were approximately 6 lbs. 7 oz. but the doctors and nurses were still being cautious about the development of your lungs so they weren’t going to help things along at all, but would watch to see what would happen. They started antibiotics at 11:05 just to be careful. 1:30 am- The nurse gave your mama permission to walk the halls for 30 minutes, so Nannie and Mama got to work, hoping that some movement would get things moving. Your mom was determined that you were going to come and that she wasn’t going to leave the hospital without you. Finally around 2:45 am Nannie laid down to rest a little and everyone dozed for a bit. Just before 4:45 your mama woke with increased back pain. We were all feeling certain that surely change would have happened with all the contractions, but upon the nurse’s check your mom was still at 4 cm. Thankfully, Dr. Hyler called in something to help with the pain and your mama got instant relief and finally took a sound nap. It had been at least 15 hours since your mom had eaten anything and all she was allowed to have were the ice chips with the icky aftertaste from the hospital, so I headed out to get her a huge cup of yummy Chick-fil-a ice (and sweatshirts for Nannie and me- we were freezing!). While I was gone, she got clearance to eat, so I went back through the CFA line to get her something yummy to eat. Phew! Dr. Hyler came to check on things at 10:55 am. He decided that since things weren’t changing he would allow your mama to go home so she could rest comfortably there after her last round of antibiotics at 12. It didn’t look like they were going to get to leave with you after all and mama was definitely bummed. The slumber party was over- at least for a little while. Arianna- Your BIRTH Day Party may have taken a little break, giving you some more time to grow and strengthen, but the excitement and desire to meet you never took a break. 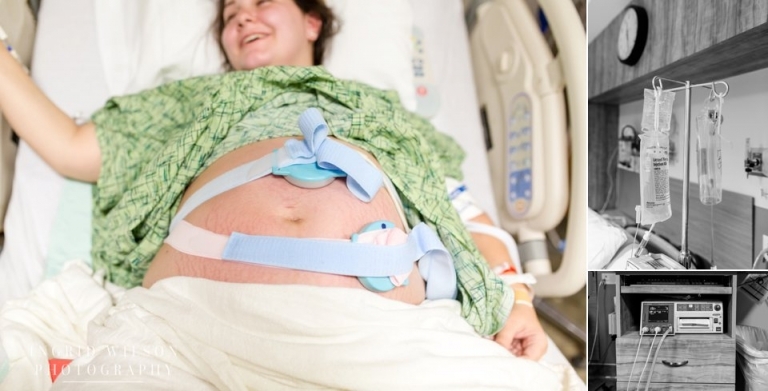 At 37 weeks, your mom’s contractions began to strengthen and regulate again around 3:30 pm. Your mom was a little apprehensive to feel excited because she was sure that the contractions would subside and she would have to wait for you again. But around 8:30 pm your Nannie insisted that it was time to go to the hospital again to see what was happening. At first check you mama was so excited to find out she was measuring between 5-6 cm! She would not have to go home again. Your arrival would definitely be soon. They were admitted to room 7 and I got the second “Baby Time!” call. Again, it was storming as I was on my way. Because of the way you were positioned and snuggled up it was hard for the nurses to monitor your heartbeat. They started to worry that perhaps you had flipped around and were breech so they called in the sonogram tech to figure it out. We all spent a bit of time holding our breath and praying that wasn’t the case and when she said that you were facing downward and just very low we all sighed with relief. It just seemed that you weren’t so crazy about having the monitors on you. Your mom had to go through the long process of signing all the forms and wavers again, even though the contractions she was having in both her back and her belly. Once all the forms and blood work were done it was finally time to call in the anesthesiologist to give your mom some relief and some rest just before midnight. After the epidural, your mom was able to get a little bit of rest so that she would be strong and ready to bring you into the world. The preparation in the room started to pick up. The warmer was turned on and the baby bed was readied. Simultaneously, the contractions kicked in pretty fiercely and without much break between them at all. Even with the epidural, your mom was experiencing a lot of discomfort. The nurse tried to help make your mom comfortable and get rid of the cervix by adjusting her positions. Nannie felt helpless and wanted to take all the pain away. She offered all her encouragement and support. Before long, your mom started to sense increased pressure and the desire to push. At 10:13 the nurse checked things out and initiated some trial pushes. She reported that you had tons of hair and called for Dr. Hyler. Things progressed pretty quickly and the nurse had to call several times to find out the status of the doctor. It was reported that he was running up the stairwell, so your mom was asked not to push if she could help it at all, but the nurses were all ready. Dr. Hyler came running in and quickly suited up. Within moments, and with just 30 minutes of pushing, you were BORN at 10:43! The entire room was overwhelmed with emotion and excitement. Everyone marveled at your beautiful thick black hair and your precious chubby cheeks. You were covered with creamy vernix and you were perfectly healthy. Your newborn exam determined that you were 7 lbs. 14 oz. and 20 inches long. Your APGAR was great at 8/9. You got to meet your great grandmother right away. You were a nursing champ for your first feeding and loved making eye contact with your mommy. Arianna- You are so loved and the joy and excitement you have brought into your family is overwhelming. 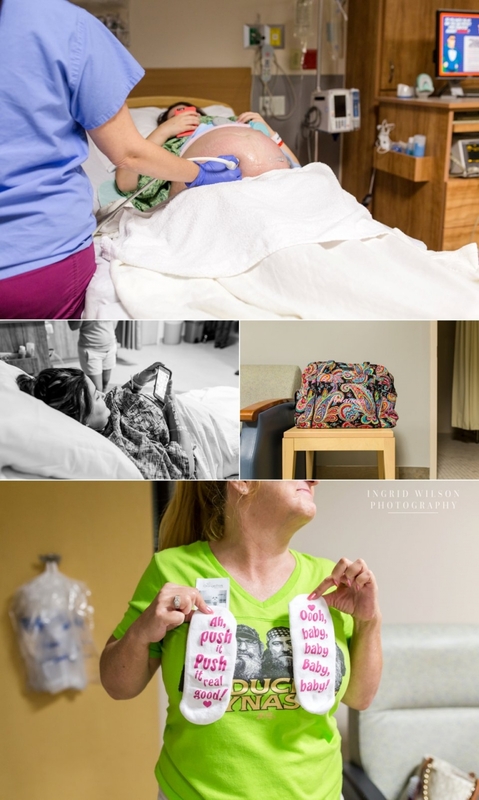 It was an honor to be there for your first moments and to capture the first chapter of your story. I look forward to watching you grow!